Sarasota Memorial Hospital has the highest rating, five stars, from Medicare.gov. Hospitals know the value of marketing. So when a hospital gets on a “best” list for a specialty from U.S. News & World Report, Consumer Reports, Healthgrades, or some other channel, it lets the world know — whether it’s replacing knees or working on spines. Many in Florida won’t be heralding their ratings from Medicare.gov’s “Hospital Compare” site. The federal government rates Medicare-certified hospitals based on 57 quality measures applied to common conditions such as heart attacks and pneumonia. Hospitals report data on safety, mortality, serious complications, infections and results of patient surveys on doctor and nurse communication and clarity. Death rates, safety, readmission and patient experience each count toward 22% of the grade. ER speed and efficient use of medical imagining — performing the right scan the first time — count for less. Hospital Compare allows consumers to compare hospitals based on the average in Florida and the nation. The most common rating is three stars — 26% of hospitals. Floridians will note that some of the state’s largest hospitals in its largest metros come from the smallest category — the 1-star hospitals that make up only 5.68% of the national total. Data, depending on the metric, range from 2014 up through 2018. Below are the ratings for the state’s 20 largest hospitals that Medicare.gov rates. The region of the state with the most high-rated hospitals? Southwest Florida. 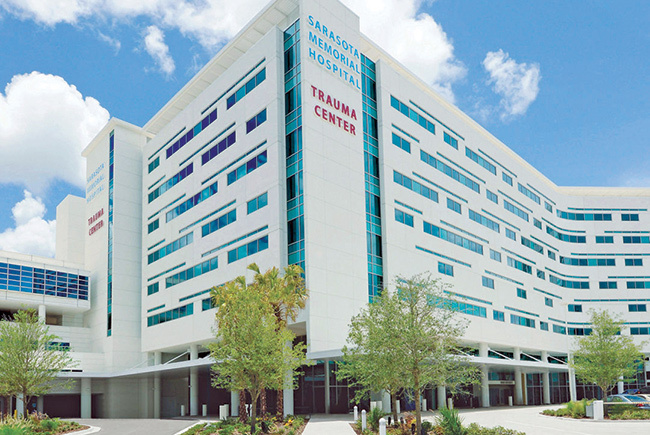 Sarasota County has one five-star hospital, Sarasota Memorial. Naples has one, NCH Healthcare System. St. Joseph’s in Tampa also had five stars. To find more information, including hospital inspection reports and fines, check out Medicare.gov’s Hospital Compare site (medicare.gov/hospitalcompare) and the state Agency for Healthcare Administration online services (ahca.myflorida.com), including FloridaHealthFinder (floridahealthfinder.gov). Worse than national rates for serious complications and deaths from complications. Just 58% of workers got the flu vaccine, far below the national average. Compares unfavorably on complications, the death rate for stroke and colonoscopy follow-up. For years, the taxpayer-supported Broward Health system has struggled with political infighting and lousy governance, people at least said the district board troubles didn’t affect care. Maybe. Mediocre scores on patient survey. Compares unfavorably on readmissions. Speed through the ER — depending on which metric is measured — is either faster than average or at least average. Compares favorably on in-hospital infections and death rates, worse on readmissions. Speedy ER. No worse than average death rates. Scores well in ER speed but compares unfavorably on sepsis — a dangerous though fairly common infection — and blood clots and readmission. Readmissions and death rates are average but compares unfavorably in serious complications. You’ll wait far longer than average in the ER. ER speed is a mixed bag — faster time to being admitted, but 20 minutes longer to be seen by someone. Better than average rates of readmission and complications and no worse than average on infections and death rate. Does well in getting people a timely ECG and aspirin for chest pain. Worse at readmission.